Vampires first entered the pop culture arena with Bram Stoker's 1897 novel, Dracula. Today, vampires are everywhere. From Buffy the Vampire Slayer to the Twilight Saga to HBO's True Blood series, pop culture can't get enough of the vampire phenomenon.Bringing her literary expertise to this timely subject, Susannah Clements reveals the roots of the vampire myth and shows how it was originally immersed in Christian values and symbolism. Over time, however, vampires have been "defanged" as their spiritual significance has waned, and what was once the embodiment of evil has turned into a teen idol and the ultimate romantic hero. Clements offers a close reading of selected vampire texts, explaining how this transformation occurred and helping readers discern between the variety of vampire stories presented in movies, TV shows, and novels. 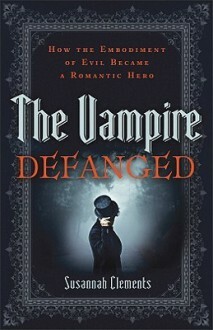 Her probing engagement of the vampire metaphor enables readers to make Christian sense of this popular obsession. Although this book looks at the vampire legend and its handling from Dracula to Twilight from a Christian perspective, it's doesn't do so in an obnoxious or unreasonable fashion. Very enlightening.